If You Want The Success Of Gary Vaynerchuk, You Have To Work Like Gary Vaynerchuk. For many people the dream of building a successful business is real. To be able to create something from your own ideas and to build it into a multi-million dollar enterprise is the stuff dreams are made of. We’ve all heard the success stories of people like Steve Jobs — drop out of university, team up with a tech genius and build a world-changing company. Or Gary Vaynerchuk — turn a liquor store into a huge online success and then build a media company and become an internet sensation. It all seems so easy. The truth is it’s not easy. It’s incredibly hard. The media has a tendency to focus on the glamorous side and play down the daily grind. There are very few glamorous moments. The real truth is eighteen hours a day, seven days a week of mundane grind. It’s about grabbing a few moments with your family when you can and it’s about missing out on a social life. For most twenty-somethings, getting out on Friday and Saturday nights with friends, having a few beers and talking about how they are building a business to change the world is considered essential. We need a break sometimes don’t we? The problem here is, Gary Vaynerchuk never took a break. While all of Gary Vaynerchuk’s friends were out partying and chasing girls in their twenties, Gary Vaynerchuk was in his father’s liquor store working. Fifteen hours a day, seven days a week. While all of Steve Jobs’ classmates were out tripping in the seventies, Steve Jobs was working on building the Apple I with Steve Wozniak. It was a relentless, seven days a week grind. Back then, nobody was talking about them, no media organisation was chasing them for interviews. They were just like you and me, nobodies in a world full of nobodies except they were doing things differently. They were not socialising, they were not partying. They were working. They were doing the boring, repetitive, mundane work that everyone hates, but has to be done to build the foundations of success. 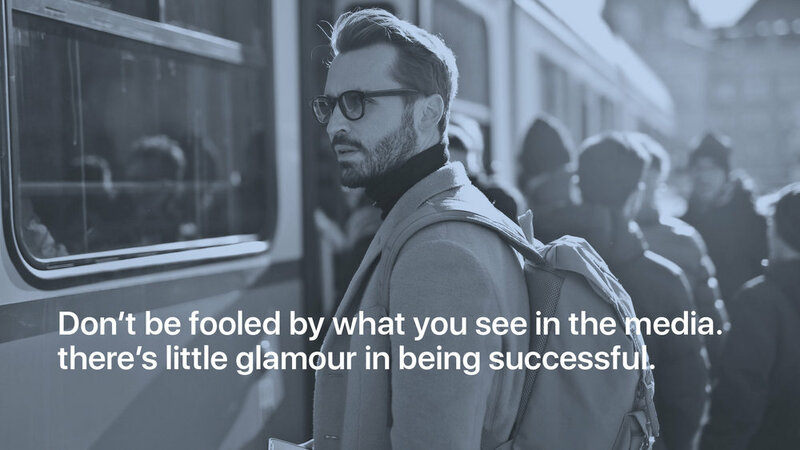 It is only when people like Steve Jobs, Gary Vaynerchuk and Elon Musk break through and become successful, as defined by the media, does the media begin to pay attention. It is only when they have achieved some form of success do they start writing about these people. They show the corporations they have built, they show off the products created, but they never show the hard work and grind it took to create these successful products and businesses. The failures, the ‘back to the drawing board’ moments and broken friendships and relationships. None of these is ever shown. They are not part of the glamour narrative. The failures though, the back to the drawing board moments and broken relationships are 99% of what it takes to become hugely successful. I occasionally watch a Gary Vaynerchuk keynote. He very generously posts them on his YouTube channel, and he is always telling people to stop focusing on the glamorous side of entrepreneurship. He’s constantly talking about the grind, the hard work and the sacrifices. Even in his short videos on Instagram and Facebook, he talks about patience and the lack of it most people have today. Yet, you can tell from the questions his audience ask that most people still don’t get this. They believe they can become hugely successful without the sacrifice. No, you can’t. That’s not the way the world works. Tony Robbins tells the story of how Sylvester Stallone turned Rocky into a huge success. The repeated rejections, his first wife walking out on him, having to sell his beloved dog and the sleepless nights. The grind of writing and re-writing the script with no money for food. All this happened when nobody knew who Sylvester Stallone was. He was a penniless bum with a dream. Just like most of us were at some point in time. But what made him different was he would not accept defeat. He knew he could make it as an actor and he was never going to settle. He was prepared to go through hell to get there and he did go through hell. When Rocky became a success, that was when people started to pay attention. The journey to creating Rocky was quickly written out of the narrative and the focus was on the glamour. How many millions Sly was making from the movie and when the next one would be coming out. And the same happens with Gary Vaynerchuk today. We all see him walking around the streets of LA, New York or London talking to the camera. It looks glamorous, it looks like the dream life, but it is only a snapshot of his day. It’s fifteen minutes of a day with 1,440 of them. 1% of his day! What we don’t see is the other 99%. The dealing with clients, the day to day mundane business he still does seven days a week. The reality is if you want to be hugely successful you are going to have to spend your life focused on the 99% mundane, boring, repetitive work. The glamour will not come for a very long time. The work and sacrifice must come first and it’s decades of work and sacrifice, not a few months. And it will never stop. Your friends will be your business associates. You hobbies will be your work and the beautiful house and expensive car you may one day be able to buy will rarely be used. You will be spending all your time on your work, not driving down PCH in a Ferrari California or sunning yourself around your pool. Your reality will be the office, a regular taxi and a hotel room. Now, are you prepared to make that sacrifice? At the end of the day, you will always be remembered for what you accomplished and your happiness will flow from what you have achieved and what you are striving to achieve. Happiness does not come from the glamour. It comes from a sense of purpose and accomplishment. 99% of you will not be prepared to make that sacrifice (which is fine) and that is why only a tiny percentage of people will ever become as successful as Gary Vaynerchuk. Thank you for reading my stories! 😊 If you enjoyed this article, hit that like button below👍. It would mean a lot to me and it helps other people see the story.